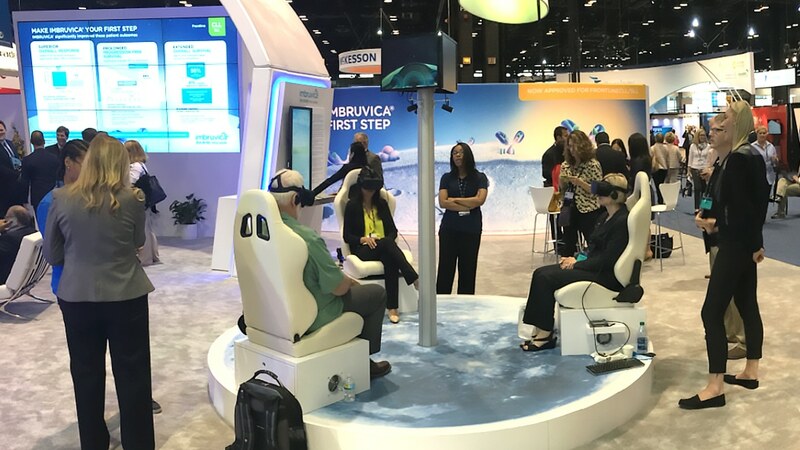 A view from our client’s virtual reality experience we produced for the ASCO 2016 conference. Our challenge: take characters and a color-scheme from a pre-existing animation and leverage them for a real-time VR experience in the Oculus Rift. We also collaborated on the booth and chair designs to ensure optimal experience. Attendees were able to walk in/around the booth area and view the experience from multiple vantage points. A moonscape print at the base tied in with the existing campaign imagery. The hybrid team custom-built the Oculus Rift stations and provided equipment for the show. Over the duration of the conference, the booth had a steady stream of visitors, receiving nearly a thousand views. Click here to view footage of the VR experience.